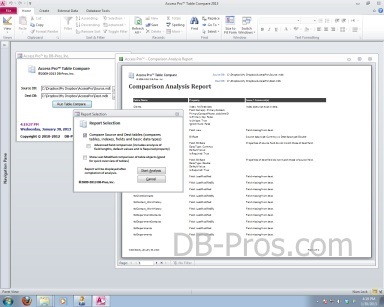 DB-Pros.com | Access Pro™ Table Compare - MS Access Database Table Compare Tool - DB-Pros, Inc. Correct database structure is essential to proper operation of Microsoft Access database applications. A single missing field or incorrect data type can cause an MS Access database to error out or break down, often during a critical process. (This can often lead to the popular belief that Access is not a reliable database solution, which is untrue -- poorly developed Access database are the issue). Oftentimes, MS Access application problems are the result of table definition errors, which can often be introduced through software design improvements, as well as accidentally. Until now, comparing table designs between 2 Access databases was a labor-intensive and tedious process that required an experienced Access professional to get reliable results. With Access Pro™, you can easily and accurately identify table design differences between 2 Access databases. The Access Pro™ Table Compare Tool's built-in table analysis functions will expertly analyze all user table fields, data types and properties, primary keys and indexes of Access tables. Whether you need to analyze one table or 100 tables, Access Pro™ will examine and compare the 2 Access database (.mdb, .mde, .accdb or .accde) files and generate a comprehensive report detailing the differences. Access Pro™ was developed by DB-Pros for internal use in quickly solving issues with our customers' Access databases. By popular request, we decided to offer this utility program directly to our customers and the public. Now you can experience the power and benefits of this valuable tool. Access Pro™ Table Compare Tool will pay for itself the first time you use it! Only $49.95 for a single user license, including FREE updates for one year. Access Pro™ Table Compare Tool is an essential tool for anyone developing MS Access databases or anyone who relies on an MS Access application to run their business. Buy Access Pro™ today and begin saving time and money immediately on your MS Access development projects.